Black is a timeless and extremely versatile color, one that goes with everything. At the same time it can also be a very intimidating color, even if much of that is often an exaggeration based on a misconception. Take black kitchen cabinets for example. 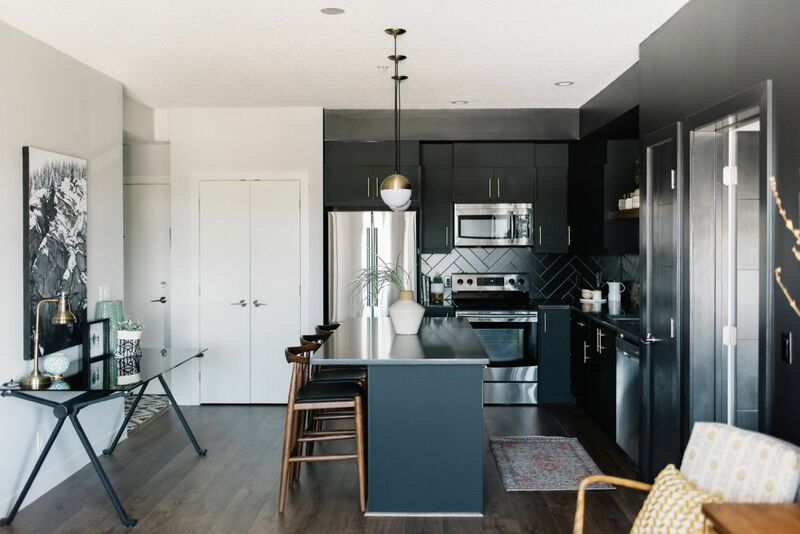 Even though, in theory, that can make the kitchen seem smaller this is rarely the case since most modern kitchens are part of open floor plans and a bold color such as black actually helps to visually delineate the spaces. The same thing goes for the kitchen island which often doubles as a space divider anyway. 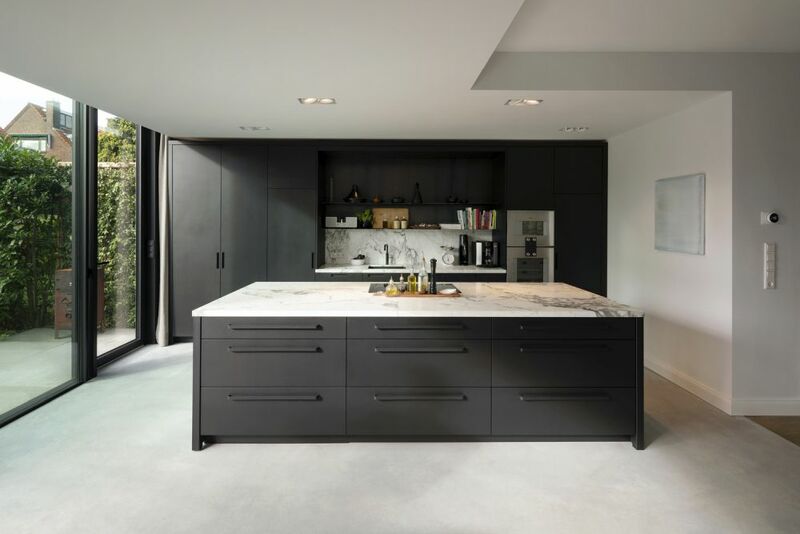 Black kitchens like the ones designed by Monique Gibson have a lot of potential for standing out by contrasting with the rest of the open plan. In one of these spaces you can actually see a blackboard wall very cleverly integrated into the design. 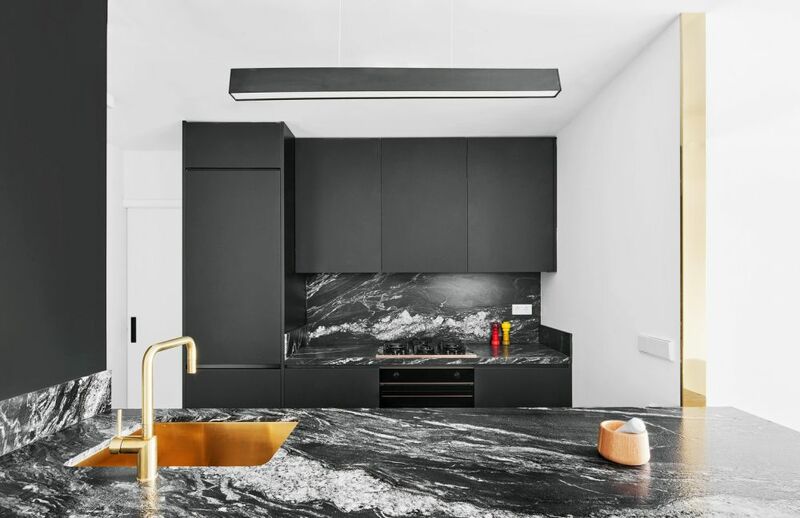 Even though it looks super cozy and inviting and it has this beautiful kitchen with black walls and a black marble island, this is not a home but in fact a workspace. The office was designed by Studio BV and features an interior design inspired by the ideas of flexibility, openness and comfort. It seamlessly combines a series of formal and informal spaces into a very welcoming and at the same time professional environment. Here’s how a kitchen with black cabinets would look like if it has white walls and countertops. This is a modern apartment designed by Sheep + Stone Interiors and, as you can see, the decor is mostly minimalist. Notice how the kitchen furniture matches the window frames? It’s a cool little detail which emphasizes the cohesiveness of the apartment as a whole. 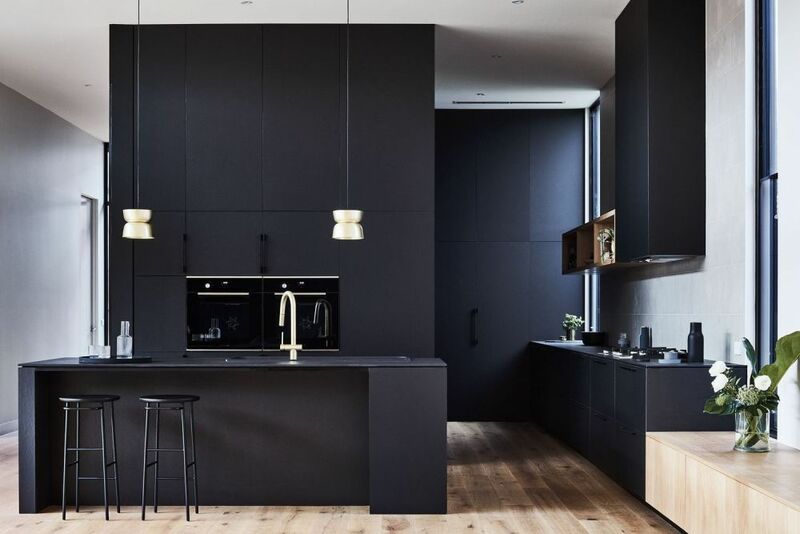 This contemporary residence designed by Auhaus Architecture in Barwon Heads, Australia has an all-black kitchen. It’s a cool look which allows the kitchen to stand out and to differentiate itself from the rest of the open space. The matte finishes and the overall minimalism of the design makes it a super stylish and sophisticated design. 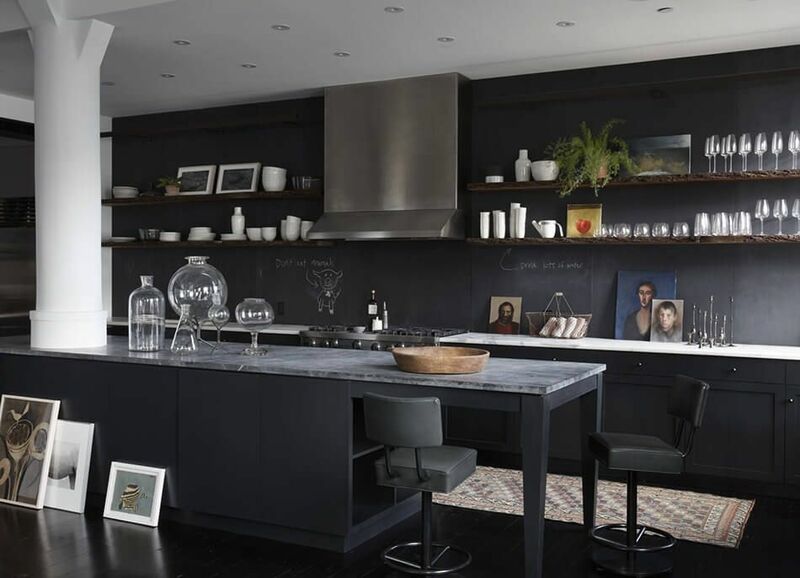 The black backdrop suits this kitchen well, especially considering this particular layout. Even if the kitchen is part of a large open space it has its own separate nook which is clearly defined by the colors used. 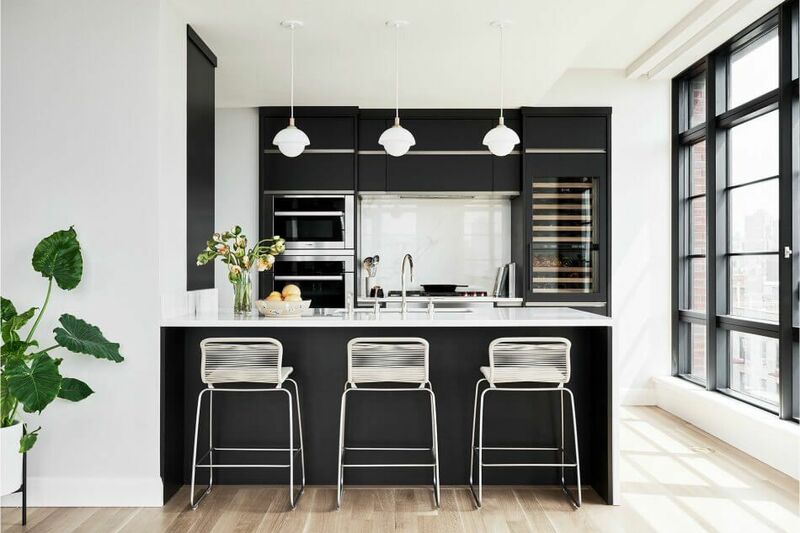 The black cabinetry is complemented by white marble countertops and a matching backsplash as well as by light gray flooring and white walls and ceilings. This is a design created by Bloot Architecture for a residence in La Haya, The Netherlands. It turns out that monochrome palettes suit modern and contemporary spaces very well. That makes black kitchen cabinets look right at home in this sort of spaces. 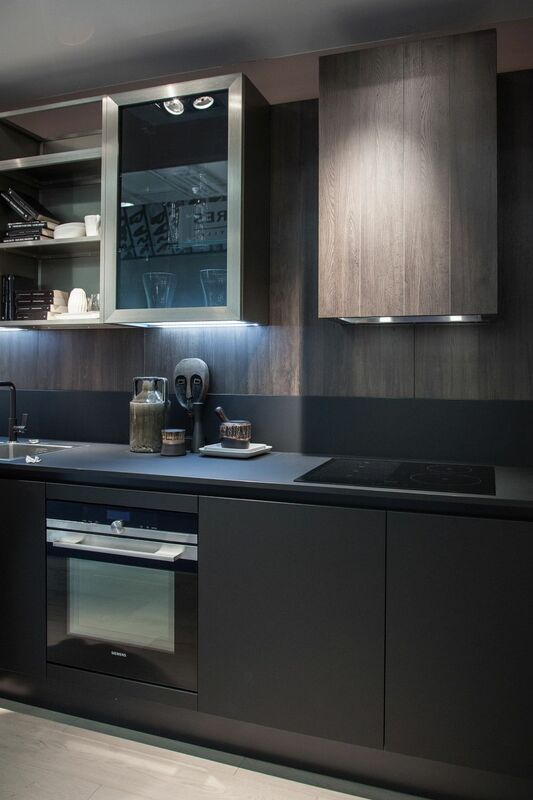 Check out how stylish this apartment designed by Daniele Petteno Architecture Workshop looks, with its smooth kitchen-living room transition possible thanks to the matching gray kitchen cabinets and wall unit. If you look at this house from the outside, its all white exterior lets it almost seamlessly blend into the snowy surroundings. On the inside the house is also bright and airy but in a different way. 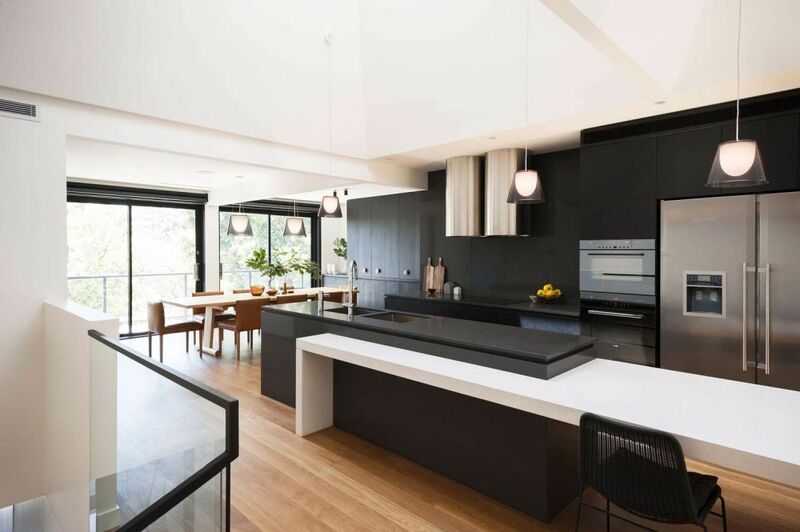 The black kitchen cabinets and stained wood surfaces turn this space into a focal point open plan social area. 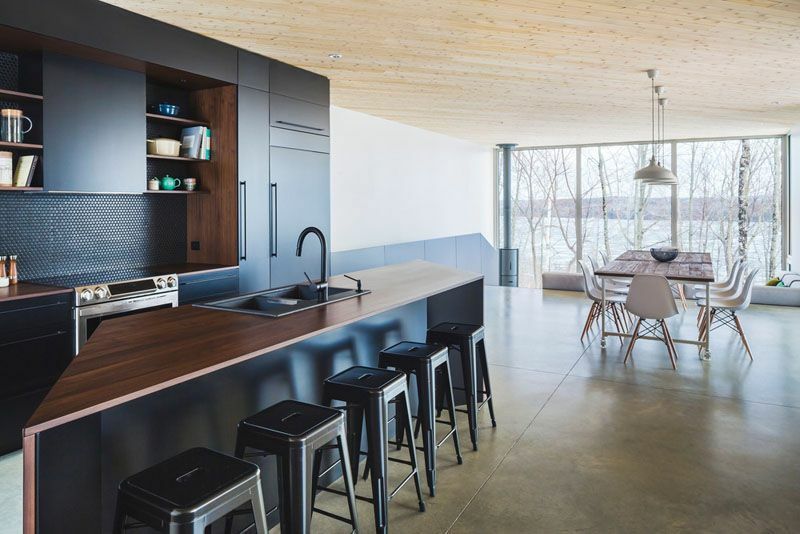 The house is located in Québec and was designed by MU Architecture. 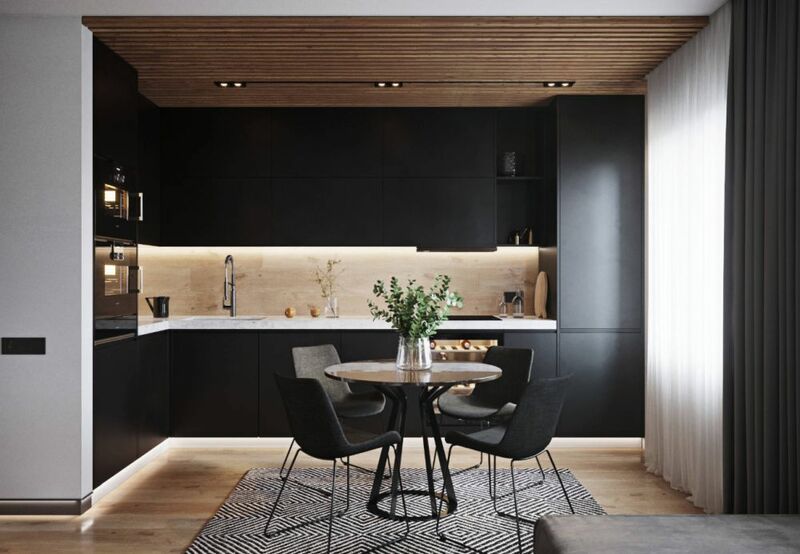 Another example that shows black kitchen cabinets are nothing to be intimidated by but in fact quite elegant is this stylish apartment located in Barcelona, Spain and designed by Raúl Sánchez. 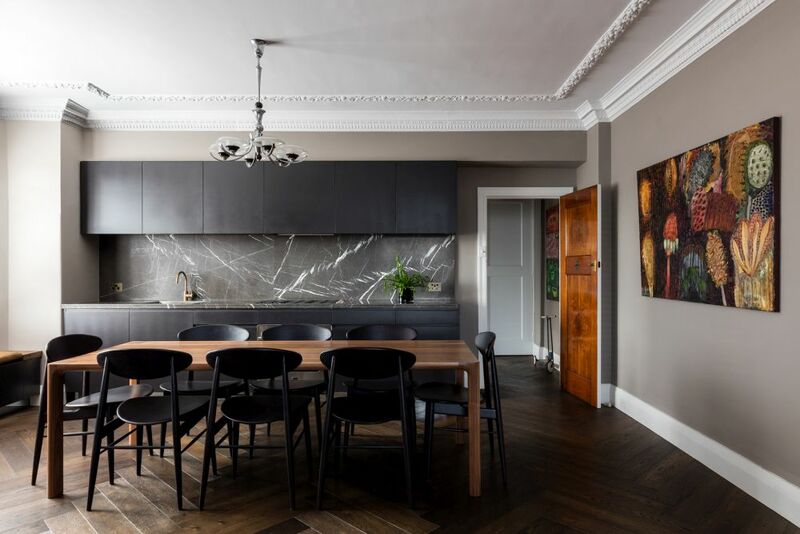 The cabinetry contrasts with the crisp white walls and ceiling and the palette is completed by black marble countertop and backsplash surfaces. 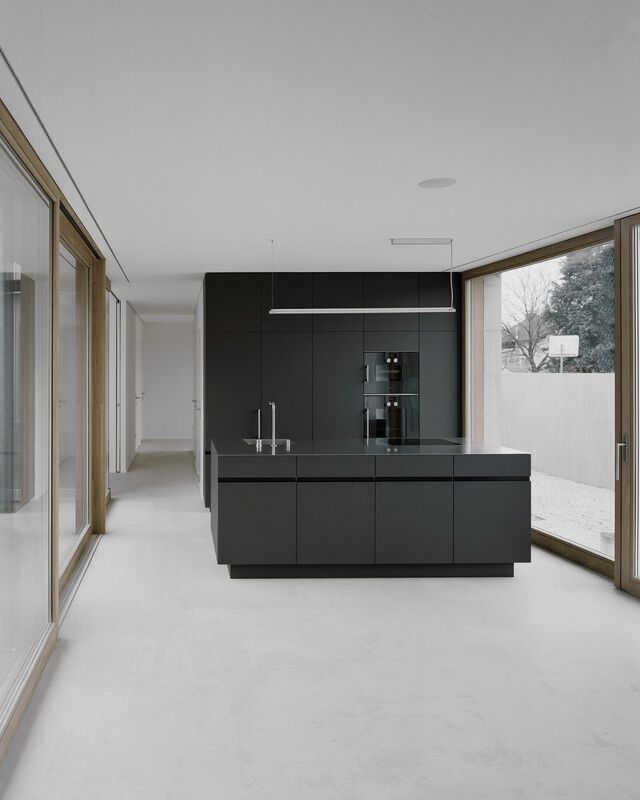 In the case of this house designed by Bechter Zaffignani Architekten and located in Austria, the kitchen is part of a large open space but looks and feels like a separate volume. That is in part due to the visual contrast between this space and everything else surrounding it. The black kitchen cabinets and the matching minimalist island play a key role in this scenario. 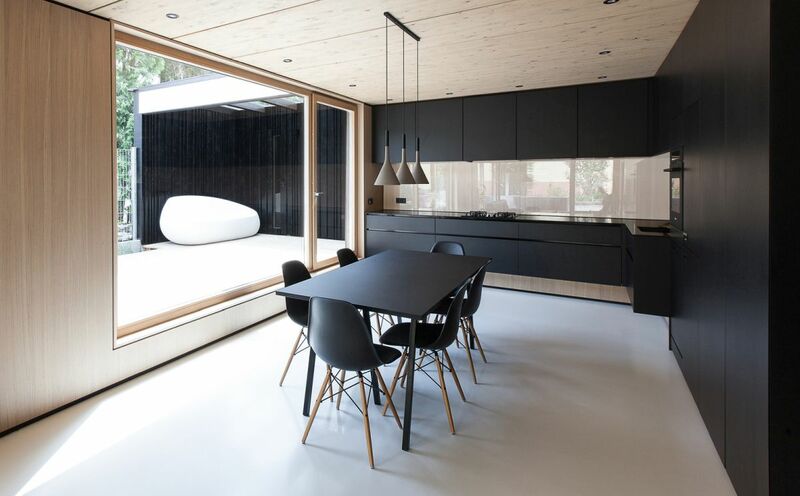 If you feel that only using black for a particular section of the interior design would result in a contrast that’s too harsh and too strong, perhaps you can find inspiration in this contemporary residence designed by Inbetween Architecture. 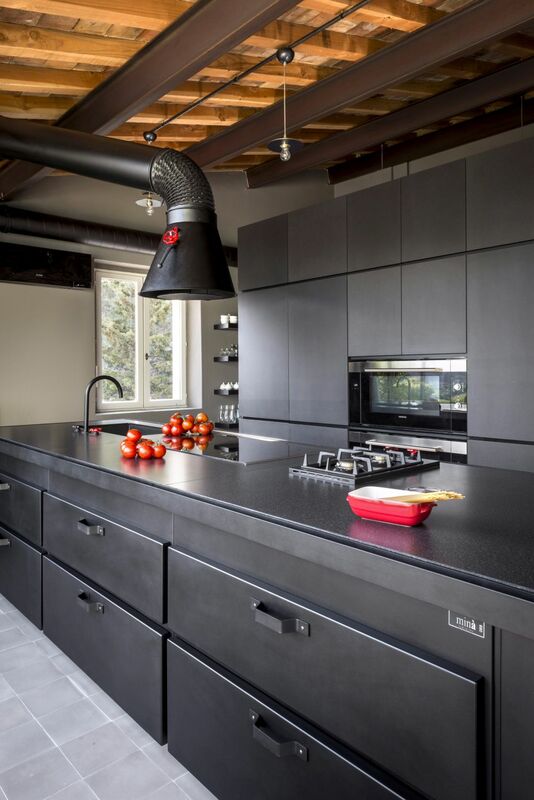 Black is a main color in this case not just for the kitchen but for the house in general. Located in Cornwall, Canada this house built in 2017 makes the most of a limited and neutral color palette. 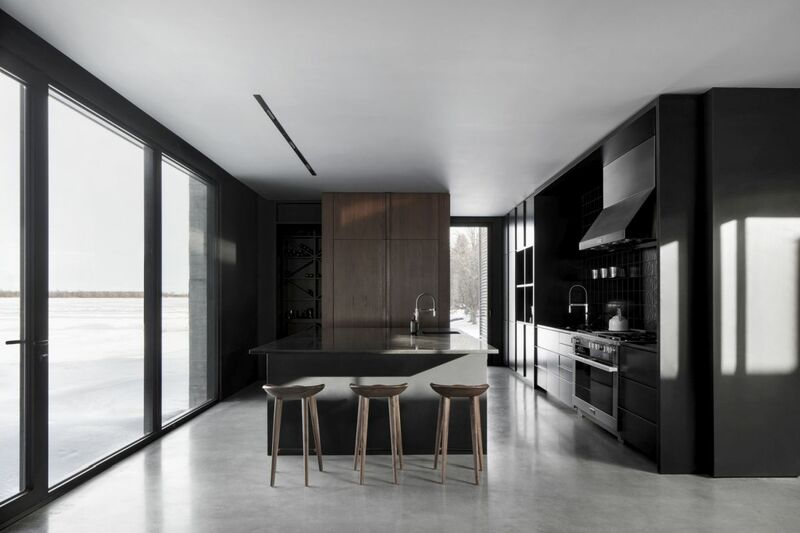 Its polished concrete floors, black kitchen cabinets and white ceilings combined with glass partitions and full-height windows seamlessly blend together in a minimalist but also harmonious decor. This was a project completed by Alain Carle Architecte. The house designed by Format Elf Architekten in Aubing, Germany features a beautiful kitchen-dining room combo. The two functions are seamlessly blended together forming this welcoming and harmonious space with minimalist black furniture, light gray flooring and light wooden wall and ceiling surfaces. the glass backsplash is a really cool detail as well. 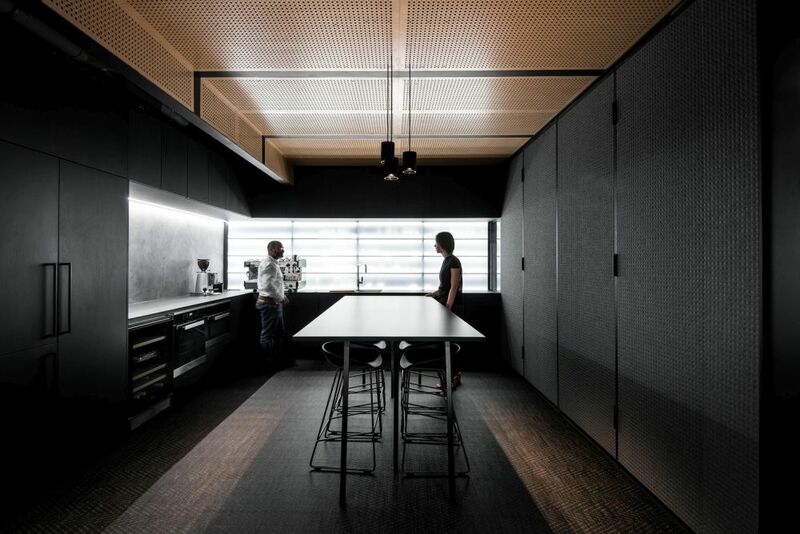 Black in interior design is a color which has the ability to make spaces look dramatic but which can also create a sense of comfort, an idea which takes a special connotation in the case of workspaces such as the one designed by Hillam Architects. Adding black furniture or finishes to such a space is like enabling dark mode on a computer: everything instantly becomes relaxing, more pleasant to the eyes and better looking altogether. It’s important to use black consciously in interior design and to avoid as much as possible to make spaces look dark and gloomy. 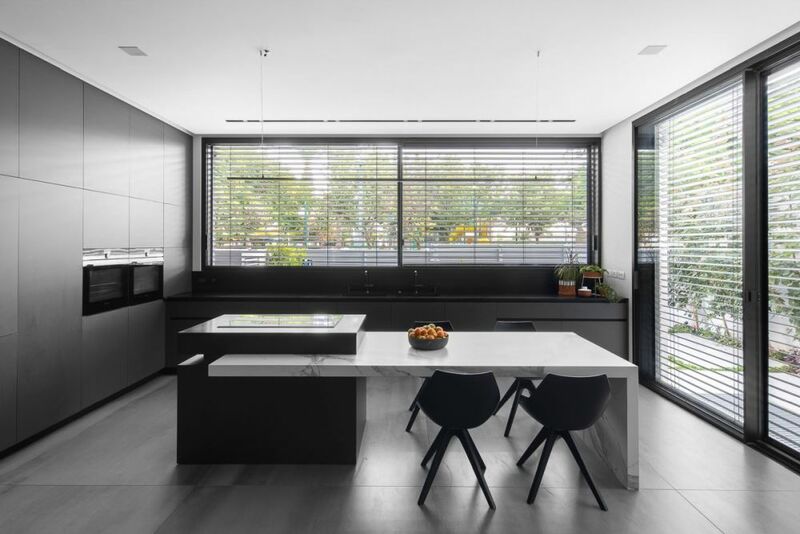 If, for example, you opt for black kitchen cabinets you should complement them with white walls or with large windows much like Studio Makom in the case of this family house from Israel. If you like the idea of black kitchen cabinets…and furniture in general, perhaps you’re also inclined to enjoy industrial design features. The style is a bit rough around the edges but also versatile and with great potential, especially when it comes to modern and contemporary interior designs. This kitchen furnished with pieces from Minacciolo is a perfect example. 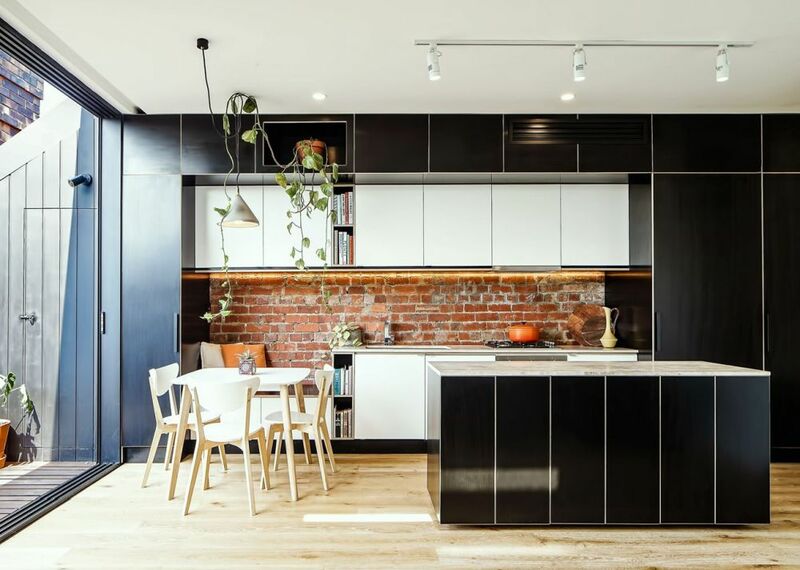 Usually, whenever we see black kitchen cabinets they have a matte finish so looking at this eclectic kitchen the whole interior design is quite unusual, not just because of the exposed brick but the choice of finishes and textures in general. Far from lacking style or character, this space designed by Megowan Architectural stands out in a very authentic manner. Danish design company Vipp is, from what we can tell, the first one to come with the idea of a custom hotel which allows guests and customers to live in and with the company’s products as a way to get a feeling of what it would be like to purchase the items for their own homes. This is the Vipp loft, a space situated on top of an old printing factory from 1910 in Copenhagen. It was designed by studio David Thulstrup. Although we really like the look of black kitchen cabinets against white walls, we find warmer color palettes to be just as wonderful. A very good example is this 1920’s apartment from Sydney which was renovated by studio TFAD. The different types of brown in this space create a super welcoming and cozy vibe while maintaining an elegant and even somewhat formal ambiance. There’s just something about black furniture and natural wood surfaces that simply looks amazing. The combination is very elegant and also very versatile. In this setup, there are also the white subway tiles to take into consideration. They add a classic vibe to the space and help the wooden shelves and everything around them stand out even more. You might be surprised to know that this is not the cozy interior of a home but actually a little section of the Magnolia Market from downtown Waco in Texas. Check out more impressions of this place on sarahjoyblog. 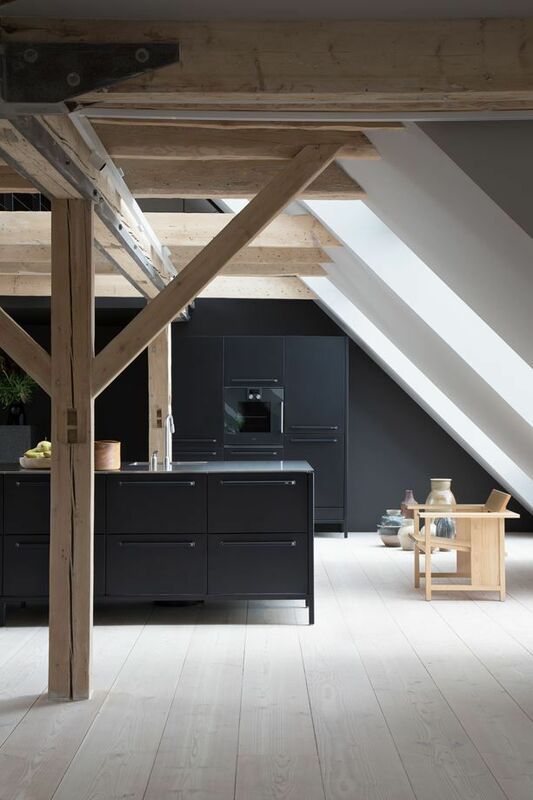 In case you’re wondering, black is a great color not just for large, open space kitchens but also for small ones. The kitchen in this small apartment remodeled by Kresswell Interiors helps to make the entire place look cozy and comfortable. The fact that there are black accent walls in other parts of the apartment helps to establish a cohesive and harmonious decor. 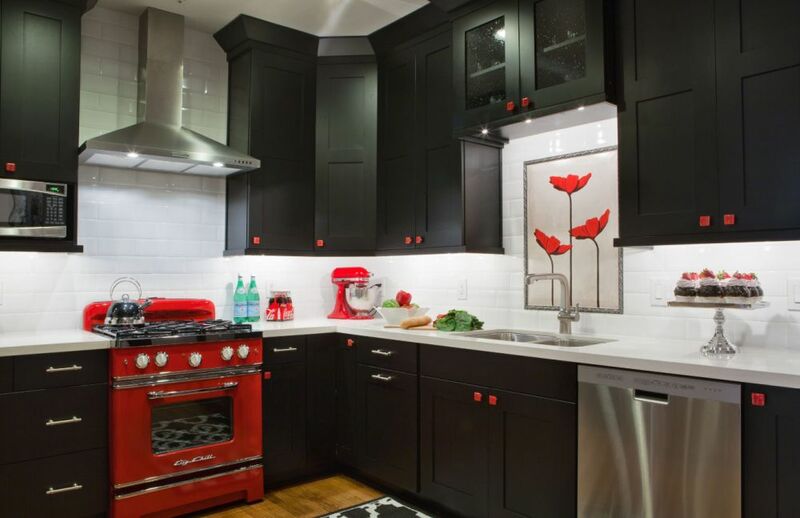 In this case, it’s not just the black kitchen cabinets that look beautiful but also the white subway tile backsplash and those red accents which really spice up the place. It’s a very classy and elegant combo created by Highland Design Gallery. The whole setup looks amazing and some of that also has to do with the eclecticism of the design. 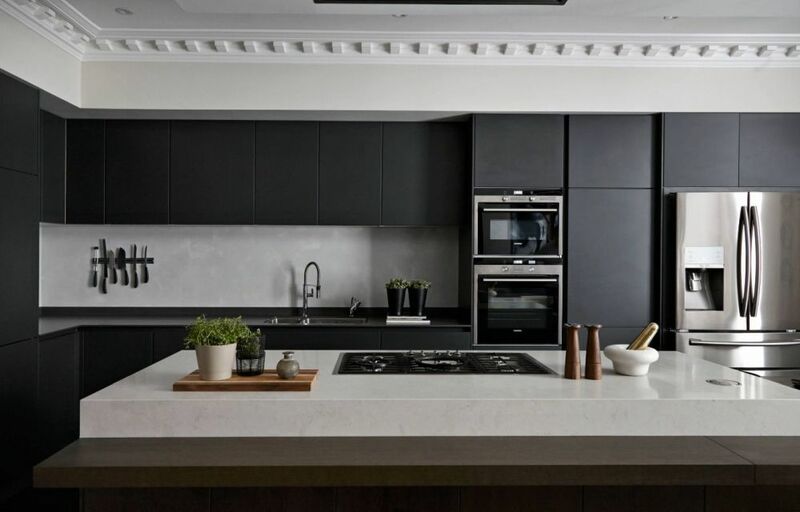 Check out another amazing kitchen which makes the most of its minimalist, black cabinets. This time there are LED light strips which make the whole setup look bright and fresh. The wood paneling on the ceiling and the backsplash and floor add warmth to the space in a non-intrusive, elegant and neutral way. This cool decor was created by Bellas Artes. 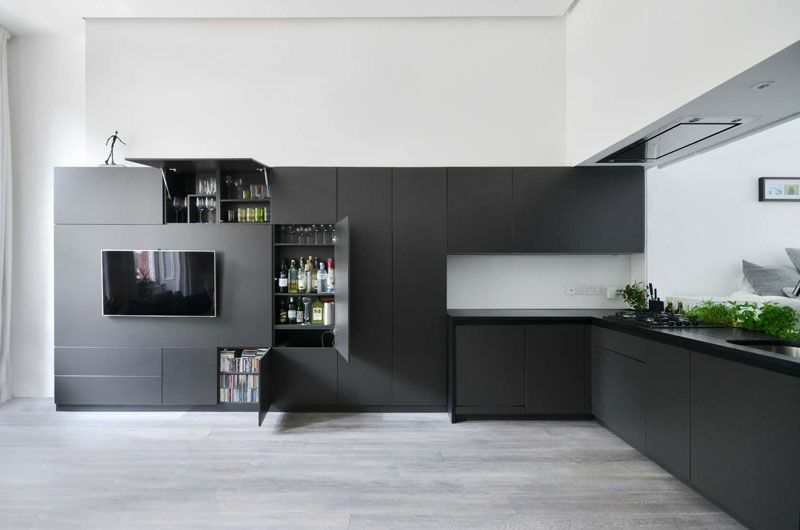 This long and narrow kitchen is not the ideal setup for a dark color palette. However, the black and white combo is an exception, given how timeless and versatile it is. 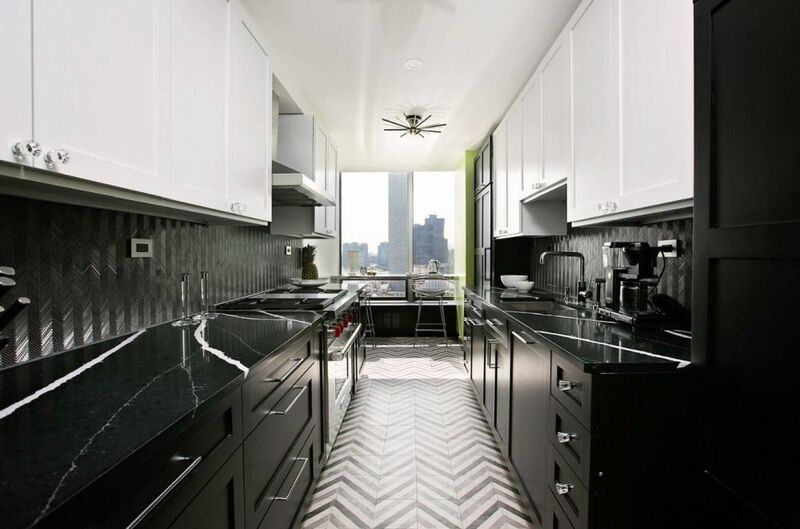 The furniture featured here is designed by Manhattan Cabinets and looks absolutely exquisite, with the patterned black backsplash and the beautiful black marble countertops, not to mention the large window which lets in lots of natural light as well as a beautiful view of the city. Interior design studio Bailey London also completed a gorgeous contemporary kitchen which offers tons of inspiration. 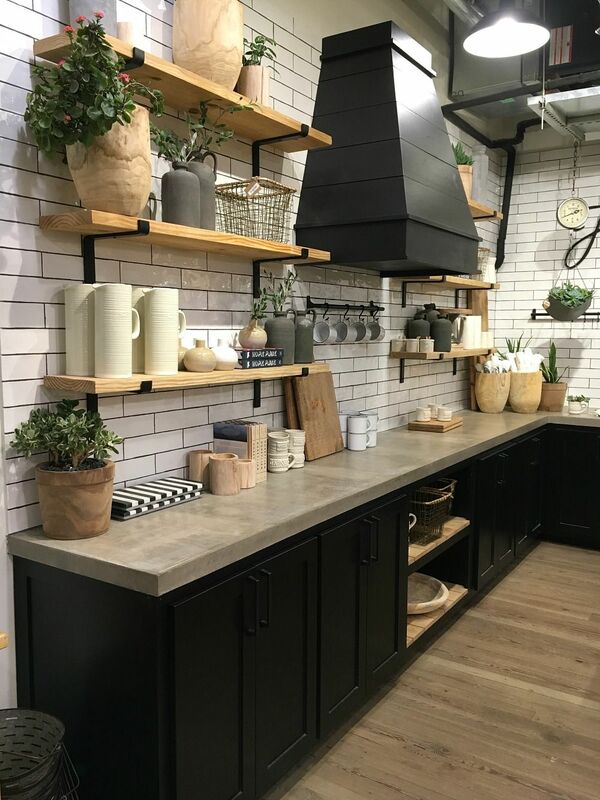 The black cabinets and the concrete backsplash go hand in hand and the white ceiling complements and frames everything in an elegant and at the same time simple manner.